I attended the Agile South Coast meet up a couple of weeks ago where Pawel Wasilewski introduced Strategy Deployment — a management process intended to focus effort to achieve strategic objectives. Strategic deployment is also known by the Japanese term Hoshin Kanri — literally direction administration or compass management. It is a term that comes from Lean Manufacturing and has been in use by Toyota since the 60s. 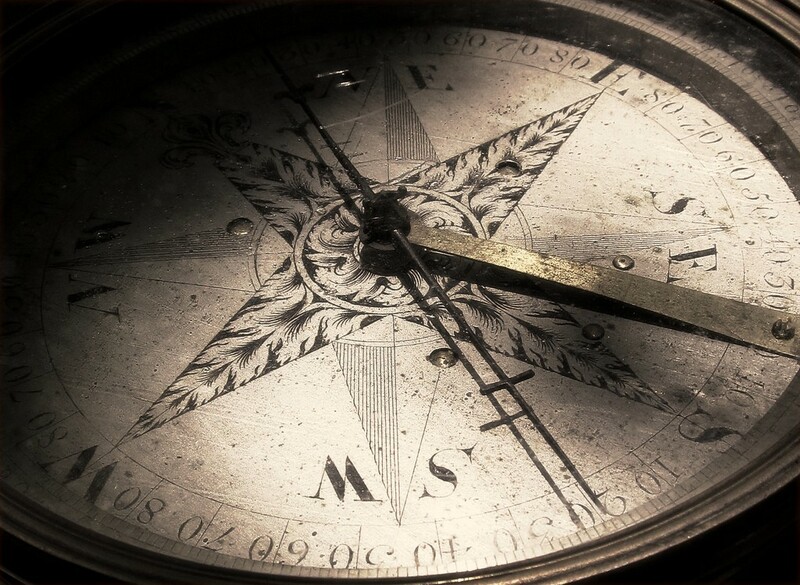 True North — the orientation to inform what should be done. More direction or vision than destination. Tactics — the coherent actions we take. These are the experiments we will undertake to test our hypotheses. Evidence — the outcomes that indicate progress. Data to know you are on track. The XMatrix is a visual template for visualising an organisation’s alignment True North, Aspirations, Strategies, Tactics and Evidence. It should be completed collaboratively and gets everyone involved in understanding exactly what needs to be done. During the workshop each group was provided with a case study company and an XMatrix A3 to fill in. By adding the Aspirations, Strategy, Tactics and Evidence to the sheet, and then examining the correlations the group was able to have good discussion about the tactics they are planning to deploy, whether they will be a good investment or whether they are even relevant. Something that wasn’t clear to me during the workshop was whether the Evidence would be measures of leading or lagging indicators. Having read at the 4DX book recently these were at the front of my mind. 4DX describes lag measures as tracking measures — measures that show you past performance. Lead measures are measures of the behaviours that you think will predict success, and that can be influenced by the people doing the work. The simple example used in 4DX is weight loss. The kilograms on the scale is a lagging indicator, whereas calories consumed is a leading indicator. By measuring how many calories you consume on a daily basis, and aiming to keep them below a specific level you can then predict that you will be able to lose weight over time. Your weight is a lagging indicator of how well you have done at keeping your calories down, whereas you can actively manage how many calories you consume. I decided that I would try to apply this model to the weight loss example. The first step is to understand the True North. Losing weight isn’t a goal in itself, understand why you want to lose weight is what’s really important. For me, this is easy. It’s really about being healthy and trying to improve the chance that I’ll live longer and see my kids grow up and support them as well as I can. 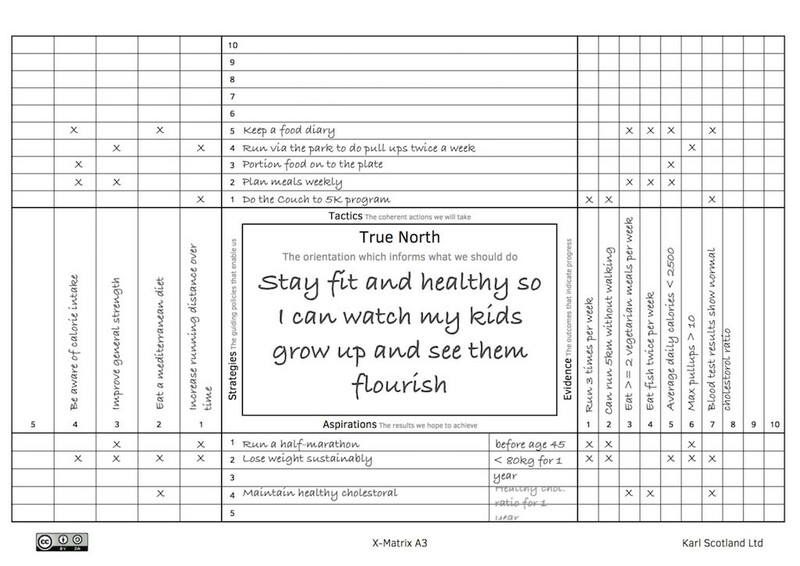 With that as my True North I realised that weight loss is one of the Aspirations. I aspire to weigh less, and I have a good idea of what would be a healthy weight. I can also see that I have other aspirations that lead me in the same direction. To be fit enough to run a long distance, and to maintain a healthy cholestorol level. The model says that the aspirations should include some scale of what we want to achieve. This is where the lag measures belong. You can check progress on these over longer periods to see that you are moving in the right direction. From here Strategies start to present themselves: run further, improve general strength, count calories, eat a mediteranean diet. Evidence then is where the lead measures comes in. I can measure how far I’m running each week, how many calories I’m consuming, how often I’m eating fish, etc. The Tactics are what I’m going to do to make sure that I’m running further, eating healthier. How I’m going to move the needle on the lead measures. Things like using the couch 2 5k program, plating food as portions, doing a weekly meal plan. I’m looking forward to trying this model out at Cucumber Ltd. I think that it will help to frame some of our strategic discussions and stop us drifting down to tactics too early. I’m really keen to see how working together on the corellations will help us to decide where to focus our effort. My XMatrix after I’d filled it in.